It’s Friday again, and again Sunday has come up with another awesome Ryan Gosling pictures. I have been busy planning Sassy Girl’s Birthday with incoming family and a bounce house party, but I always have time for a quickie with Ryan. Ooooo, I love thin mints!!!!! Wish they made gfcf ones too, my lil man loves them as well! Mmmmmhmmmmmm…this is delicious in more ways than one! I know there are recipes for homemade ones (I know, I know more to do :D) that I think maybe able to be adapted; although I haven’t looked to far into. Now I’m hungry! 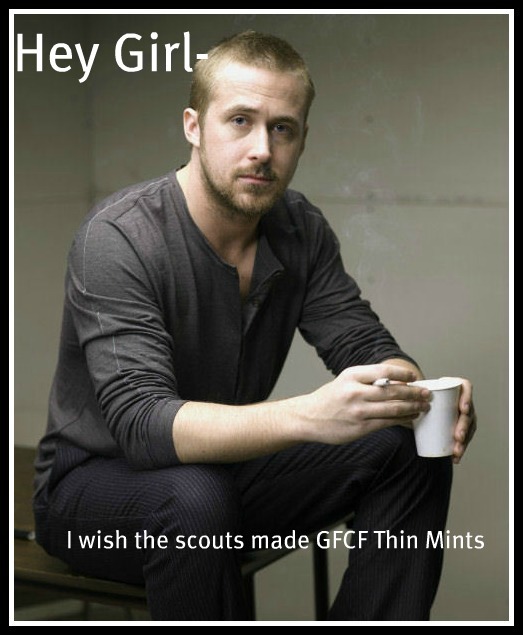 I wish a lot more than Thin Mints would be gfcf. I’m actually working on a GFCF thin mint recipe this weekend, as the DH still eats the evil gluten and there’s like 5 boxes of the green happiness taunting me. I’m sharing this meme at my pinterest.